Crown of Eternity has spent their lives serving people through vibration, sound, music, and energy healing. Through their extensive international tours with concerts, workshops, therapy sessions, and retreats they have helped thousands of people connect to their life energy and to self healing. 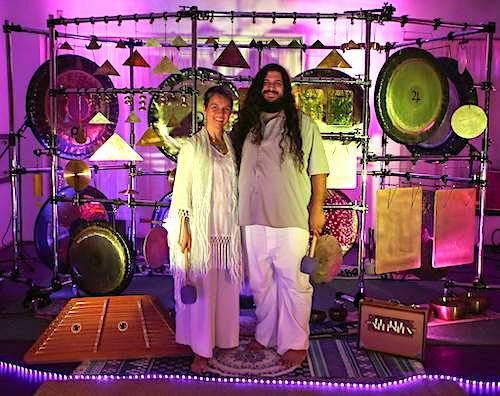 They have performed at Sat Nam Fest, Bhakti Fest, the Kripalu Center, and hundreds of yoga studios and wellness centers throughout North America. They have trained many budding sound therapists on the healing aspects of the Gong. Together, Mike and Gallina Tamburo have developed their own style of relating to the therapeutic uses of sound, incorporating ancient wisdom and infusing it with creativity, playfulness and joy.